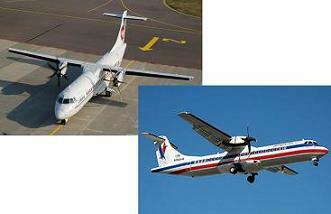 The ATR 72 was made from the ATR 42 by making the fuselage longer by 4.5 m (14 ft 9 in), growing the wingspan, adding up more powerful engines, and growing fuel capacity by about 10 percent. The 72 was made public in 1986, and made its initial flight on 27 October 1988. Precisely one year after that, on October 27, 1989, Finnair became the 1st company to put the aircraft into operation.